WHO I FISHED WITH: This past Friday morning, January 18th, I was honored to be invited by the Wounded Warrior Project (WWP) to provide a guided fishing trip for six of their members. Planning for this began back in early December when I met with WWP’s San Antonio-based outreach specialist over lunch and we ironed out the logistics paving the way for this morning’s successful trip. The WWP believes every warrior has a next mission. WWP knows that the transition to civilian life is a journey. And for every warrior, family member, and caregiver, that journey looks different. WWP is there for their first step, and each step that follows because they believe that every warrior should have a positive future to look forward to. There’s always another goal to achieve, another mission to discover — WWP is their partner in that mission. More than 52,000 servicemen and women physically injured in recent military conflicts. 500,000 are living with invisible wounds from depression to post-traumatic stress disorder. 320,000 experience debilitating brain trauma. WWP helps these men and women. By our 7:30 a.m. start, I had the Army, Navy, Air Force, and Marines all represented and ready to go. I suppose I’ve never felt safer on a fishing trip before!! Joining me were Hector Licon (Army), Tito Cortez (Army), Antonio Oquendo (Army), Devon Wikstrom (Air Force), Doc Richardson (Navy), and Carlos Espinosa (Marine Corps). Carlos got the award for most enthusiastic. Devon got the big fish award for his 6.75 pound drum. Hector got the early-bird award for showing up first. Doc got the best beard award; Antonio got the award for most persistent angler; and Tito earned the best story-teller award. There is still much debate about who caught the most fish. We expect this will be figured out about the same time that the government shutdown is resolved! 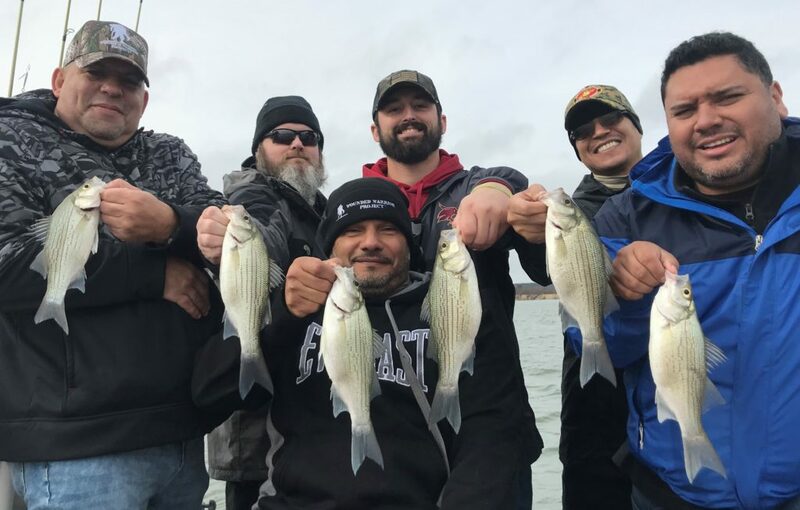 THE WARRIORS: from left — Antonio Oquendo, Doc Richardson, Tito Cortez, Devon Wikstrom, Carlos Espinosa, and Hector Licon, each with one of the 2-year class white bass we landed this morning. Air Force veteran Devon Wikstrom with the trip’s largest fish landed — a 6.75 pound freshwater drum, nicknamed “gasper gou”. All five other participants claimed to have hooked and lost larger fish!! HOW WE FISHED: Today’s approach involved a mix-and-match of snap-jigging, easing, and smoking, all depending upon how the fish presented on sonar. 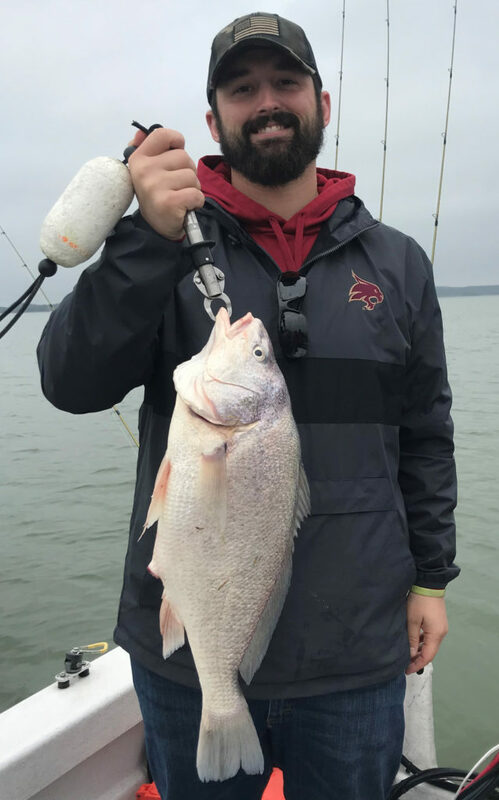 During the time the fog persisted, the bite was slower, and the fish were glued to the bottom; we used a snap-jigging tactic and pulled fish steadily during this time. Once the fog cleared, we were treated to two distinct episodes of helpful bird activity, each of which lasted about and hour with about a 30-minute pause in between. When we first arrived in the vicinity of the birds, a more aggressive approach worked, then, as the frenzy died (as witnessed on sonar) and the fish settled, we changed up our tactics accordingly to continue to boat fish. The white, 3/8 oz. slabs I make, rigged with my Hazy Eye Stinger hooks, caught every last one of our fish today. No 3/4 oz. slabs, no soft plastic. OBSERVATIONS: Due to the amount of time we focused on suspended fish this morning, the number of drum we caught relative to our total catch was much lower. When we have to rely on snap-jigging more heavily, the drum count seems to increase. 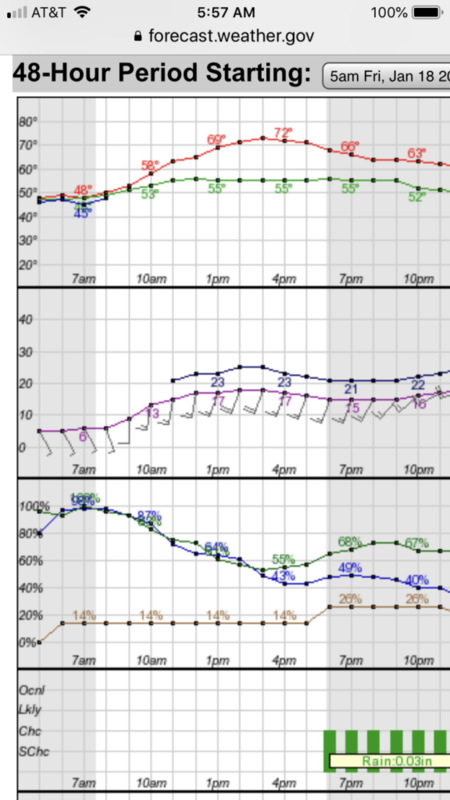 Sky Conditions: A moderate fog until 9:06a, then 100% coverage of light grey clouds.